Been a while since I picked up the Retro Reviews. Too much other writing had to get done, and lots of pressure. But what better way to get back into it than with Simon West’s Con Air, one of the most wonderfully stupid, unabashedly cheesy films of all time. The major selling point of the film is the outstanding cast. Keep in mind that at the time Nicolas Cage was still riding high as both a dramatic actor and action star. The Nic Cage of today, more caricature than character actor, had yet to manifest itself. Though you see it shining through, the beginnings of the ham, in this film. Backing him up in this film? John Cusack, John Malkovich (who scared me when I watched In the Line of Fire and who does a good job of showing a sense of self-awaredness in his portrayal of Cyrus the Virus here), Ving Rhames, Mykelti Williamson, Rachel Ticotin, Danny Trejo, the always awesome Steve Buscemi as a Hannibal Lecter-type serial killer (who in more absurdity winds up singing, “He’s got the Whole World in His Hands”), Dave Chappelle, and a bit part for Monica Potter as Cage’s wife. In the beginning, orchestrated with “How Do I Live Without You” blaring in the background attempting to provide emotional grounding for a film that will patently do away with making sense, Cage’s Cameron Poe and Potter, his pregnant wife, are reunited after Poe’s tour of duty in the desert, and have a romantic dance in a honky tonk bar. Looking on at the young couple are a group of rednecks who have the hots for the pregnant Potter, and who generally push the buttons of the man in uniform. I love how wonderfully stupid these guys are (and yes I am aware that I’ve used the phrase wonderfully stupid already and this verges on bad writing, but really,there is no better description). Of all the women in the honky tonk, they decide to hit on the PREGNANT GIRL WHOSE HUSBAND HAS JUST SHOWN UP IN MILITARY UNIFORM. He’s got the friggin Ranger badge on his shoulder. And so the couple, intent of spending the rest of their lives together, rushes out into a pouring rain (seriously, right?). But before they can get in their car and leave, the rednecks block their way. At which point Poe kicks their asses and when one draws a knife, he delivers a killing blow. Then one of the surviving rednecks conveniently picks the knife up in his escape. Poe is brought in and sentenced for manslaughter. Through montage we pass the years, and watch as Poe grows out his hair. Nic Cage sports what would be a mullet, were he not rocking a receding hairline. The unkempt, unruly hair becomes its own character, whipping about and waving through numerous frames. Then we get to the day of his release. Which also happens to be the day that the most dangerous prisoners will be transported to a new prison. So he winds up on the plane with them. And then they take over the plane. Seriously. They do. Meanwhile, on the ground, everyone’s response is to just blow the plane up. John Cusack spends most of the film’s running time conveying to the other characters that they shouldn’t blow the plane up. That’s pretty much his thing. From this set-up we are treated to random craziness, people dancing to “Sweet Home Alabama” while performing violent acts, or threatening violent acts, things blowing up, burns and firefights and big explosions. Which is to say that I actually find the film pretty awesome in its willingness to eschew aesthetic sensibilities and storytelling. Look, when you’ve got a premise like this, you might as well go big right? No one’s expecting anything sensible from you anyway. And if that’s the case, then you better be over the top. And over the top it is. If anything though, the problem with the film (apart from the apparent story issues, lack of character development, cliches, cheesiness, etc which we totally accept as par for the course) is that its humor doesn’t work. There are attempts at it, and it falls flat sadly. Michael Bay mitigated this in his earlier films like Bad Boys by casting very good comedic actors (and see how his comedy fails in Transformers, especially with the racially wrong robots). Here, it seems that it’s only Buscemi that hits it out of the park with his comedic lines. Even Chappelle fails to deliver, though I think it’s more because he is shackled into a role that has him trying for much broader humor than he is good at, and because even though Ving Rhames is also present, he has to play the Token Funny Black Guy stereotype. Ah but then the humor doesn’t matter so much because the movie does take itself seriously. Sort of. I mean, there’s supposed drama and tension, as Poe stays on the flight because he feels that as a Ranger and a man of honor, he has to help the people there (there’s a corny subplot with his best friend, played by Mykelti Williamson, suffering from diabetes and needing insulin, as one of the reasons for his staying on the flight even when he could have gotten off). There is also the drama that is supposedly drummed up by his wanting to finally meet his daughter. It’s all inconsequential though, sort of tacked on drama to justify the ludicrous action scene which are enjoyable on their own. Have to admit, I think Michael Bay has more flourish, especially with his work on Bad Boys 2 (and now I’m thinking that deserves a Retro Review), but Simon West handles the action competently, and delivers the Bruckheimer-fuelled explosions adequately. For more absurdity, the film tacks on a stuffed bunny, which Poe means to give his daughter onto the film, and it’s this toy that serves as one of the films objective correlatives (I’m not sure if there are others I didn’t notice. But really, can I be faulted for not searching for more objective correlatives in Con Air?). So we have Cage jumping through hoops to preserve the bunny, and in a ludicrous and thus extremely fun and funny scene, Malkovich holding the bunny at gunpoint. Really, it’s that kind of movie. Of course by the end we are treated to the rousing strings and the crescendo version of “How Do I Live Without You” and I can’t think of a cheesier way to end the film. I am also hard put to find a film that is so effortlessly cheesy. 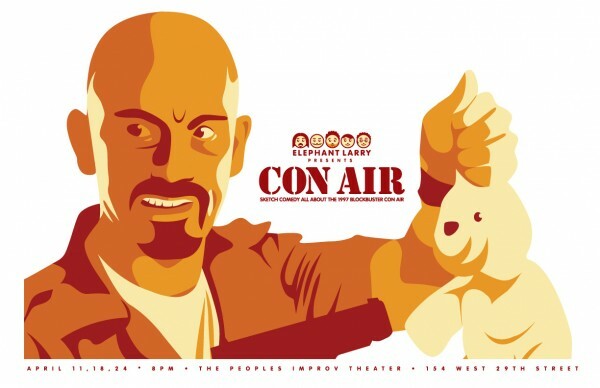 Therein lies the fun of Con Air which really should be viewed by everyone, if only for its being so genuinely, wonderfully stupid.